I don’t think I’m unearthing any secrets with this one. This famed Burmese restaurant in the Richmond has been featured on the Food Network numerous times and is reputed for having constant lines out the door. Somehow, when I showed up at 12:30 on a Sunday, a time when I assumed the restaurant would be at peak capacity, it in fact had no line. I was seated at a two-top on my own immediately. Amazing. It’s not a huge restaurant, but there are plenty of tables to accommodate groups of any size. And although the menu is pretty inexpensive, the decor is nice enough to qualify this as a date night spot. Awesome ethnic date night on the cheap alert! 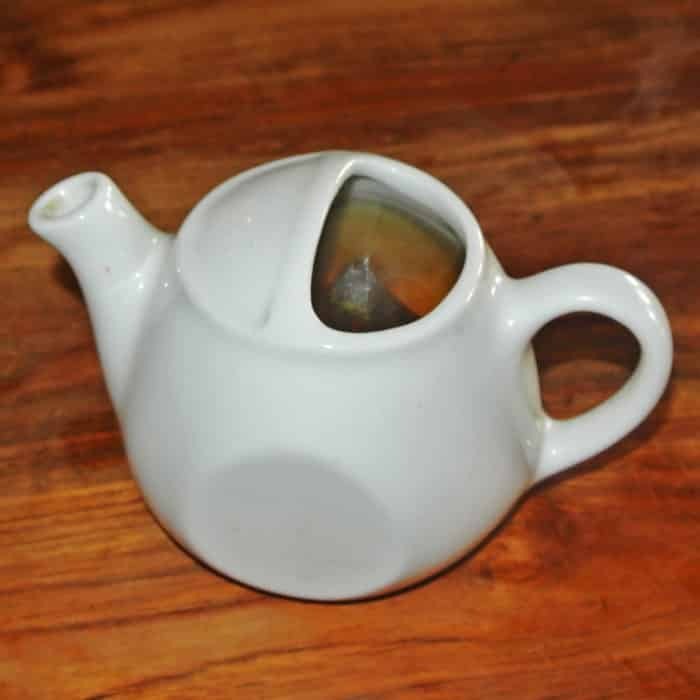 Since I had gone bar-hoping around San Francisco the night before, I was feeling a bit hungover and ordered myself a pot of hot tea right off the bat. I went with a black tea varietal called Golden Monkey which really soothed my ailing body and got some caffeine flowing in my veins. Now, I’m no expert in Burmese food. In fact, this was the first time I’d had the pleasure of experiencing it. 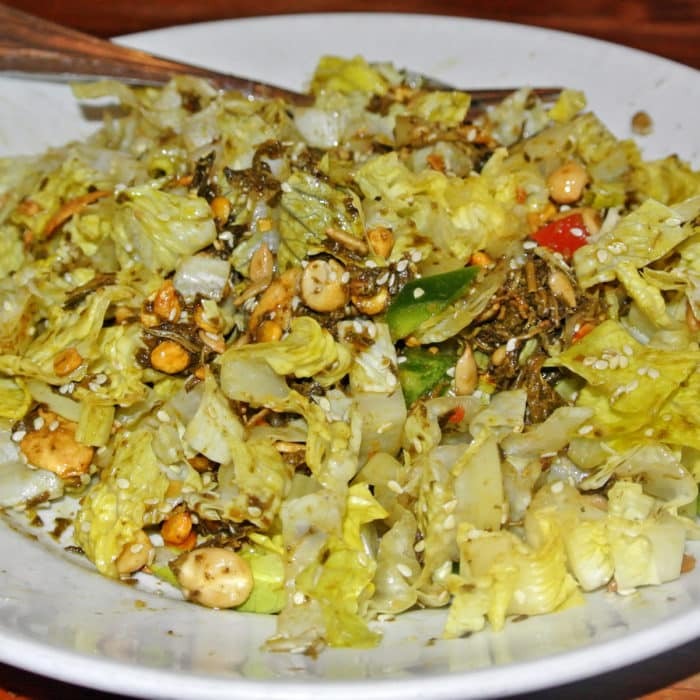 So I followed the oft-trodded path of the many culinary adventurers before me and ordered two of the famed dishes that have been featured on the Food Network, starting with the Tea Leaf Salad traditionally known as Laphet Thote. I’m sure you’ve noticed, I don’t eat salads very often. But people totally freak out about this salad, so I knew I had to try it. If there’s a salad I’d ever get excited about, this truly unique one is it. It arrives are the table with each of the many ingredients neatly organized in separate piles. The server happily names and points out every single one, which included thinly sliced Napa cabbage, roasted peanuts, toasted sesame seeds, dried yellow split peas, sunflower seeds, dried shrimp, crispy fried garlic, tomato, cilantro, sliced jalapeño, and fermented green tea leaves hand-carried back from Myanmar. It’s all dressed with sesame oil, fish sauce, and lemon juice and tossed table-side, transforming the once neat and beautiful bowl into a scrambled-up chaotic mess. Taste-wise, it’s actually relatively mild, but it had just enough of an interesting multitude of flavors to keep me excited. What really made this dish so memorable though was the range of varying textures. There are so many crunchy elements that paired really well with the damp, deep green tea leaves and crisp romaine. 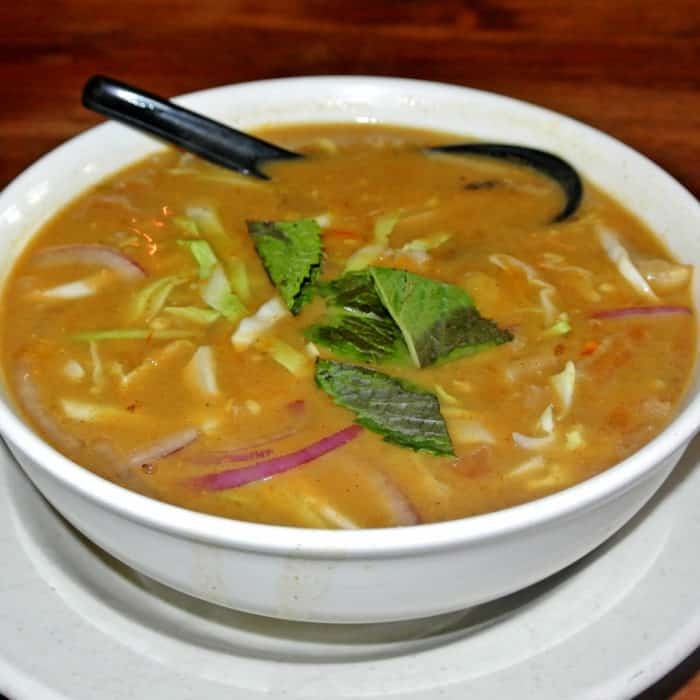 Along with my salad, I ordered another Food Network featured dish, this time a hot bowl of completely vegetarian soup called Vegetarian Samusa Soup. The menu said something about vegetarians and meat-eaters alike loving this dish and after having it, I can understand why. There was so much going on in terms of flavor and texture and it was super comforting during a hangover. It had many flavor and ingredient influences from the many countries and cuisines neighboring Myanmar. I’ve definitely tasted a lot of things similar in Thai, Indian, Indonesian, and Middle Eastern dishes before. This thick, curry-like broth was extremely bright, complex, and flavorful and was loaded with doughy puff pastries similar to Indian samosas as well as ripped-up fried falafel balls and plenty of lentils stunningly similar to an Indian daal. It’s a totally wacky dish with all sorts of influences, but it came together incredibly. 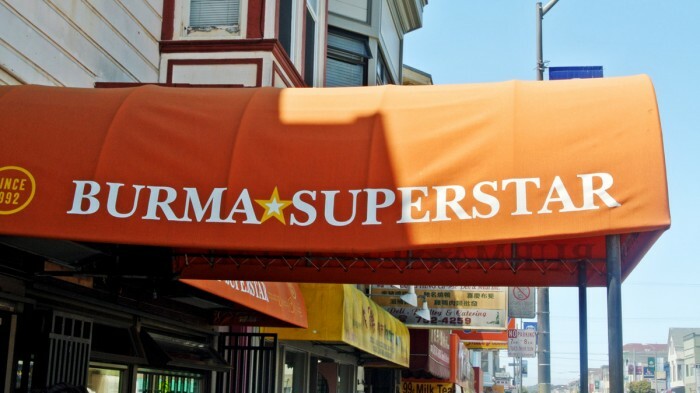 So if you’re curious to try Burmese food, I’d highly recommend heading over the famed Burma Superstar. Hopefully you can luck out like I did and not have to deal with any lines to enjoy that incredibly unique cuisine. 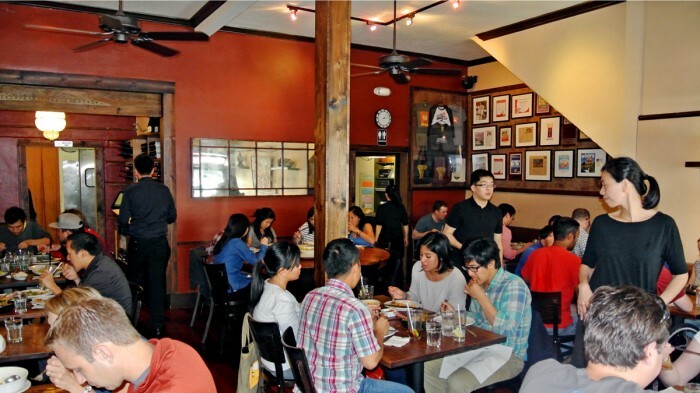 Got another interesting ethnic eatery in San Francisco? Let me know in the comments below.